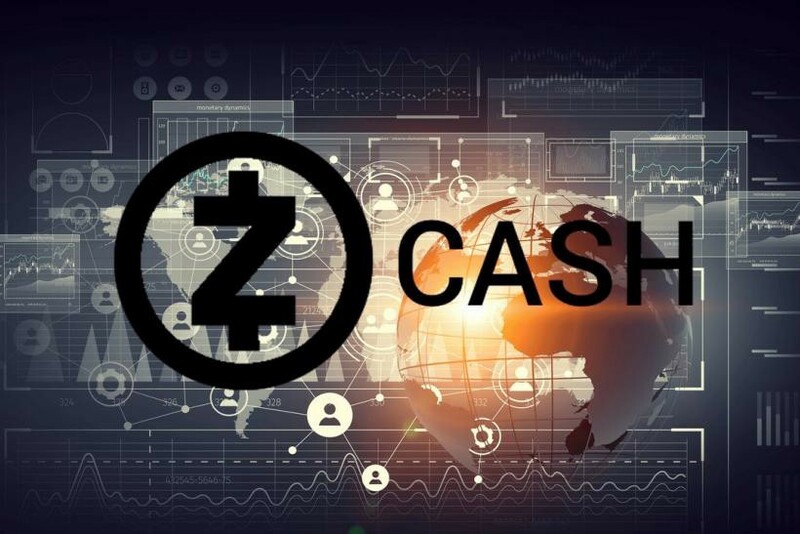 ZCash hasn’t been mentioned a lot in the public sphere lately, which is interesting when you consider the fact that it was one of the coins that Coinbase claimed it might possibly place on their exchange platform. Without any concrete hints though, it’s anybody’s guess as to whether that will happen or not. If you’ve seen the price action lately, it seems apparent that investors either don’t believe that it will be added or they do not care. Ethereum Classic’s lackluster performance since being added to the exchange is sure to deflate a few bubbles that were counting on this as a means of ZCash’s price going up in the near future as well. While this isn’t new, it is something that a lot of people seemed to be suddenly becoming aware of recently for some reason. For those that do not know — ‘Zooko’ is the name of the founder of ZCash. The way that ZCash is set up is so that the users of the protocol directly pay him. There’s more information about how this works in this extremely biased, oddly one-sided article that exonerates Zooko Wilson for receiving such payments and shames the crypto community for even questioning it. Ironically, all the article actually did was just bring the issue to light. As you can probably see from the article preview (if it shows up on the platform that you’re viewing this article on), you’ll see that it mentions that Zooko receives 2,033 $ZEC/month. At a market price of $157 (approx.) at the time of this article’s writing, that amounts to about $320,000 a month, residually. This is regardless of performance, achievements, accolades, flaws, errors, work completed, etc. — In other words, the payment is completely outcome independent. The author will admit that they failed to mention the fact that individuals did not know how much that Zooko Wilcox was receiving as the CEO of ZCash, just the fact that he was receiving some sort of a ‘founders’ fee’. The revelation that the fee was several hundred thousand dollars/month obviously unsettled some users in the crypto world that saw this as an exorbitant rate of payment. Regardless of your personal opinion on the ethics or logic of founders receiving a ‘reward’ from the crypto that they designed themselves and its benefit/harm to the community/protocol, one obvious fact is that the revelation of the total amount of money Zooko received/year was not received very well in the crypto community (hence the CoinDesk article being written). Perhaps this delves a bit into conspiracy theory, but who knows what prompted such an article to be written with such a heavy, biased slant in favor of Zooko Wilcox receiving payment. In the author’s opinion, these protocols more than likely make under the table payments to authors at different publications in exchange for favorable articles on them. This quid pro quo relationship may not be known by the publication itself, but there is no denying that it definitely occurs in and outside of crypto. Frequently. In all types of publications, on up to the New York Times. In short, this is the first “Sapling compatible version” of the protocol that’s being released. So, in a nutshell, what this update is supposed to do is allow the Zcash developers to modify the protocol in such a way where even less information about the transaction is sent from one user to the next and/or that less information needs to be known by one user from another in order for them to send the transaction without their being a compromise in the security of the blockchain itself. ZCash is a privacy cryptocurrency. That means that it is designed to obfuscate/hide/make it impossible to track the transactions the same way that you would with any ‘normal’ blockchain explo9rer. Zcash works via zkSnarks, which is a concept that is not relegated to blockchian or crypto, but rather used in general. Basically, it allows for all transactions to be verified on the blockchain without the other nodes having to download the entire history of transactions. Not only does this lower the requirement/load each node must have, it also is meant to give more ‘secrecy’ to the transaction itself . Ideally, the protocol is supposed to facilitate entirely untraceable transactions. So obviously, adding an update that will make it so that the transactions are even less untraceable (because they are not entirely untraceable at all at this point), is something that would make a fundamental difference (positively) in the value of the protocol, assuming this is a successful endeavor. One will have to see whether this has a tangible impact on the actual traded value of Zcash, because, so far, it has had none (at least since the release of the news). As you can see from the picture above, the price has been getting throttled as of recent. However, more importantly, the price is nudging right up against a really solid support for Zcash. Now, if the support can hold and the price bounces from here, then the gains will more than likely be decent. However, if the support breaks, that’s probably going to be a problem. Remember, this is on the daily chart. 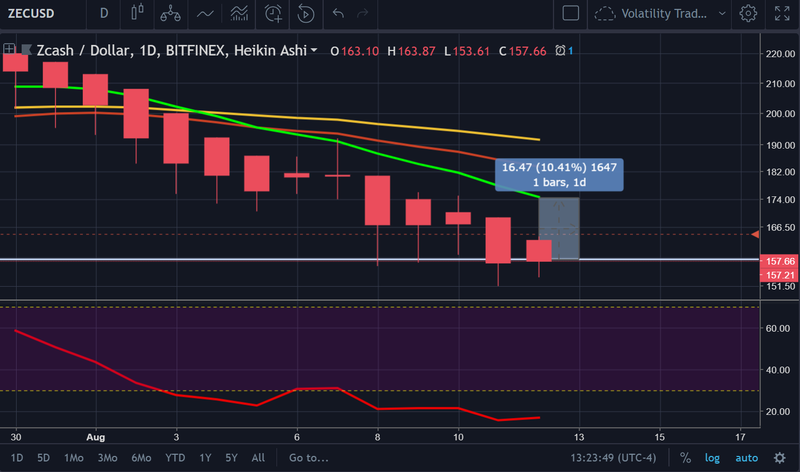 One positive sign is the fact that the RSI is entirely oversold at this point and its on the support. a) It means that (based on prior price data), the RSI is indicating to us that the bears have potentially reached their max threshold on $ZEC and may be ready to ease up. b) At some point, the momentum will carry back upward, which will result in an increase in the price. How much? Who knows. So, the setup looks good. 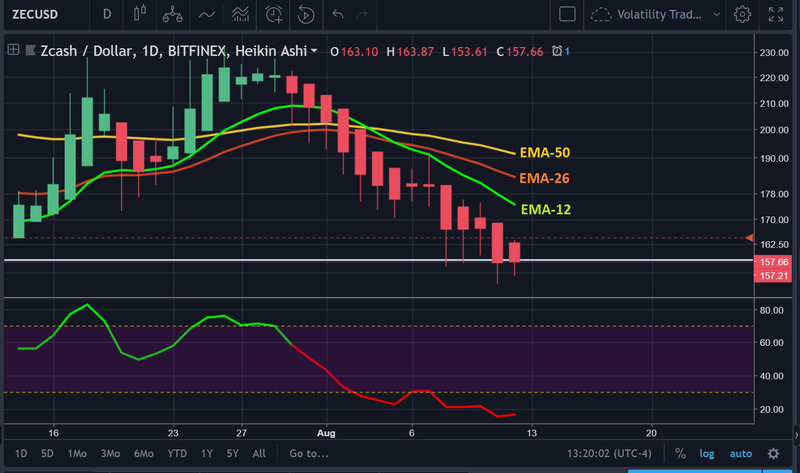 The good news (for bulls) in the chart above is the fact that the EMA indicators (on the daily) are far above where the price is now. The nearest overhead EMA indicator (EMA-12), is sitting at $174.85 currently, which is +10% over the current price, giving it room to move. Of course, what’s bearish about this setup is the fact that the EMA-50>EMA-26>EMA-12. That’s actually about as bearish as it gets. Rarely is this looked at, but in the author’s humble opinion, it is a smart idea to check out the CMC data in this instance to make sure that the volume on the protocol is healthy. On CMC (vs. TV), you can determine the actual dollar value of the traded volume rather than just seeing a bar at the bottom of the chart. This volume total of $107 million (24H average) is actually a bit higher than what this same metric has been throughout the bulk of 2018. The price doesn’t seem to really be responding to any fundamental news surrounding Zcash — it looks like technicals are dominating the show. And based on those technicals, it’s almost impossible to make a serious inference about the price action of $ZCash until we observe the price either bounce or fall below the support point that it is at currently.